In ancient Egypt, powerful pharaohs (kings) ruled over a people for thousands of years. Let’s meet this ancient community and learn about their traditions and beliefs. What you see here is a real object from ancient Egypt. It is over four thousand years old and is called a false door. In ancient Egypt, this false door was placed in a part of the tomb called the offering chapel as a doorway between the world of the living and the world of the dead. A mummy was buried in the secret and forbidden chamber underground. The offering chapel and the false door were above ground and would be visited every day by family members and a priest who would leave offerings of bread and beer on an offering table nearby. Why do you think they did this? The ancient Egyptians believed each and every person had a spirit or life force that left the body after death. They called this spirit the ka. They believed that after a person died, his or her ka needed to receive offerings of food and drink to sustain itself spiritually. Look carefully. Do you see a figure carved somewhere in the stone? There is a figure of a man carved in the upper center of the door. This figure represents a real man who lived in ancient Egypt over four thousand years ago and whose mummified body was buried in a secret and forbidden chamber underground. Who was he? Perhaps we can figure out his name and what he did in his lifetime. Look carefully. Is there some kind of writing carved into the stone as well? Do you know what these symbols are called? They are called hieroglyphs. Some of the hieroglyphs on the false door spell out the man’s name. His name was Ni-ankh-Snefru, but let’s call him by his nickname, Fefi. Other hieroglyphs spell out the jobs Fefi did. 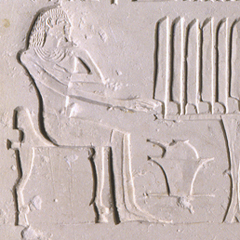 Fefi was a man of talent and advanced far in ancient Egypt. He was a priest who recited sacred texts during religious rituals. He was also the overseer of the two cool rooms of the Great House, including manager of the wine cellar and manager of food storage at the palace. Fefi could visit the royal house, which was a real privilege. Few people could visit the royal house. What is Fefi doing here? He is sitting down in front of an offering table waiting to receive the tall offerings of bread. Beneath the table is a large water pitcher and basin to clean his hands. But what if the priest or Fefi’s family failed to visit the chapel and leave any bread or beer? What would happen to Fefi’s ka? No need to worry. 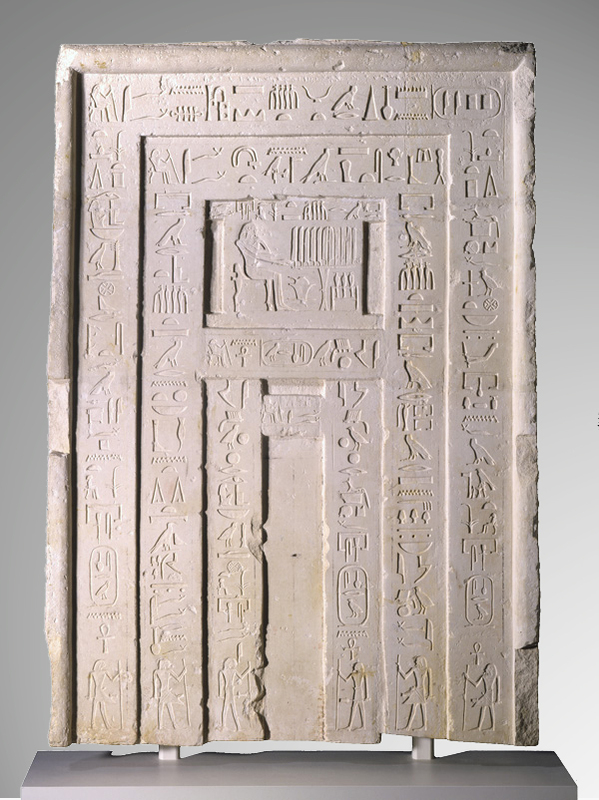 The illustrated offering scene and some of the hieroglyphs on the false door guarantee that Fefi’s ka would be provided for in the afterlife. Let’s be brave and look around. What would we find? We might find a wooden statue like this in the serdab, which is a small, sealed chamber located behind or near the false door. This statue would have worn a painted necklace and perhaps a cloth kilt (wrapped skirt). Why do you think Fefi’s family would have placed a statue like this in Fefi’s tomb? The family would have wanted to be sure Fefi’s ka had a resting place after death. To preserve Fefi’s memory throughout all eternity and reinforce the spiritual connection, his statue would have resembled him in some way. And being near the false door, his ka would have been able to easily pass through and eat and drink the bread and beer left behind by the priest! For those of you who are interested, the ancient Egyptians also believed each and every person possessed a ba, although at first they believed only the pharaohs had ba. The ba was a set of spiritual characteristics unique to each person like a personality. The ancient Egyptians believed the ba remained attached to the body after death, but through funeral rituals the ba would be released from the body and would rejoin the ka. Fefi’s ba would return every night to the tomb to his mummified body to receive new life. Would you like to see the False Door and Figure of a Man in person? All you have to do is visit the North Carolina Museum of Art in Raleigh, North Carolina. The False Door and Figure of a Man are in the ancient Egyptian galleries at the museum. Or perhaps you would like a tour. Tours of the collection are given daily, except for Monday when the museum is closed to the public. If you prefer, you can contact the museum ahead of time and arrange for you and your friends to have a private tour. I’m sure a docent at the museum would be happy to show you and your friends the False Door and Figure of a Man and many other works of art. Whether you visit the museum on your own or have a tour with a docent, it will be well worth your time! This entry was posted in Citizens in Action, Elementary School. Bookmark the permalink.